You can download and use this software free of charge. For more details see the license terms further down. Only Windows 7 and Windows 10 with .Net 4.0 has been tested. But any Windows supporting .Net 4.0 is highly likely to work. It is even possible that it will work on linux with the use of wine. This Podcast/vodcast downloader supports RSS 2.0 and Atom 1.0 syndication feeds with enclosed audio and video files of any size and any type. You can set maximum download speed/throttling, as well as maximum simultaneous downloads. Filenames based on episode title, episode publish date, podcast title and several other varying elements. Just stores the files on your harddrive for easy problem-free playback with any popular multimedia player, e.g. VLC. I made this software because I found all the other free podcast downloaders to be exceptionally awful. The primary problem with all the other downloaders, is that they download the files to some completely pointless location on your harddrive, and the files are named with gibberish. 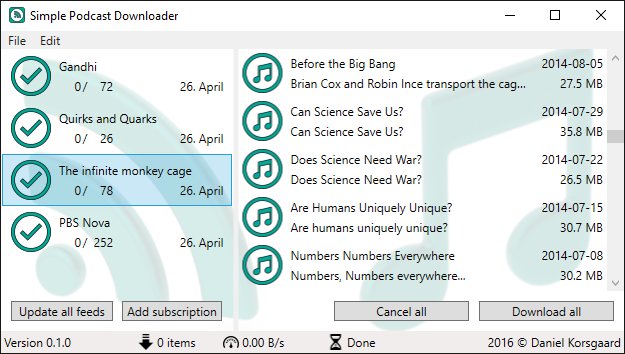 With the Simple Podcast Downloader, you can put your files anywhere, and name them exactly the way you want, according to the titles embedded in the RSS or Atom feed. Also you can download both Audio and Video content, and you can start playback directly from the downloader. In general, the interface consists of two lists. The list on the left contains the RSS/Atom podcast/vodcast subscriptions you add. If you import an OPML file, all the entries will be added to this list. If you export an OPML file, this entire list will be written to the OPML file. You can also add subscriptions by pressing the suitably named button. When you click on one of the subscriptions on the left, all the episodes will get listed on the right. If there are no episodes, it's probably because you did not yet update the subscription. When clicking the icon button on the subscription, that particular subscription will be update. When you hover that button, some text will appear, telling you if the update succeeded. The icons in the episodes list, will tell if an episode contains downloadable audio or video. If the item contains more than one audio or video files, you will only be able to download the largest of these files. When you hover the icon button of an episode, its icon will suggest what action you get by clicking the icon, and you will also get some text telling how well the most recent action worked out. The first action will generally be to download the item. Then you get the ability to cancel that download. When download succeeds, then you can start playback of the file, by pressing the icon again. In general, to find out what something is, you can hover the mouse over it, to get an idea what the meaning is. While downloading items, the status bar will give some general status about how the progress is going. You will very likely see this progress get stuck, or tell that download will be done much sooner than is actually the case. The reason for this, is because many podcast publishers will not tell how many bytes the stream is, and in fact often tells a size much much much smaller than the real size. Simple Podcast Downloader can simply not know how long download will take in those cases. Some podcast publishers do give the correct sizes, and in those cases the predicted progress is quite useful. In order to control exactly where your podcast episodes are stored, you can go into settings, and give a good default for all new podcasts. And you can also right click on subscriptions, to edit the location and other things. All the already downloaded files, will however remain in the same place they were originally downloaded. Versions, release dates and changes. Ability to show the runlenght of each episode, through the RSS tag. Slightly improved UI making it easier to read titles and descriptions. Improved error messages to be much more user friendly. corrupted, or the user regrets deleting a feed. Backups will be kept for 14 days. Improved parsing of non-standard OPML files. The Software shall not be reverse engineered, or in any way converted to source form. The above copyright notice and this permission notice shall be included with all distributions of the Software.